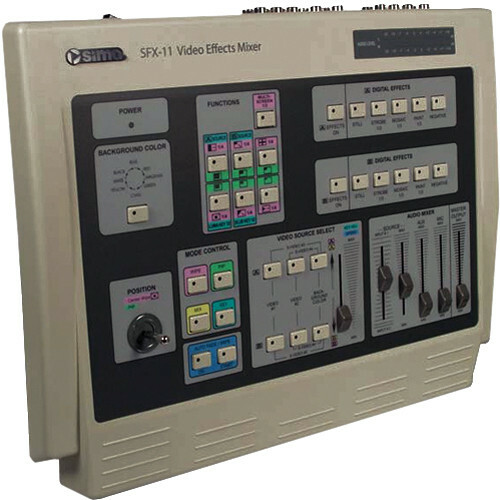 The Sima SFX-11 Digital Video Mixer offers analog to digital signal conversion and provides quality mixing options for videos using digital signal processing to produce vibrant colors and excellent picture quality. It features a 3.5mm stereo audio, 2 composite and 2 S-video inputs, and 4 outputs. In addition to offering various digital effects like strobe, mosaic, paint, still, and negative, it improves the picture quality on 2 (A/B) channels. Using the joystick to control the mixer, PIP windows can be created and moved to any location on the display. In addition to offering up to 96 wipe patterns including circle, bar, cross-hatch, corner, etc., the digital video mixer allows you to pre-set the speed of the wipes and fades for one-touch automatic control. The chroma key (blue screen) or the luminance key (black screen) allows you to isolate images and superimpose them onto other scenes. Using the ArcSoft Total Media and Media Converter, you can digitize and record edited video to HDD and DVD formats with MPEG 2, MPEG 4, and AVI compression techniques. The mixer also allows you to create iPod-capable videos. Offers up to 96 wipe patterns including circle, bar, cross-hatch, corner, etc. Box Dimensions (LxWxH) 17.8 x 16.8 x 5.0"
SFX-11 Digital Video Mixer is rated 4.1 out of 5 by 16. Rated 5 out of 5 by Anonymous from Great way to start! We bought this unit to begin DVD recording and webcasting almost 3 years ago and haven't had a moment's trouble with it. It provides silky smooth transitions for the 4 video inputs and a built-in audio mixer. It is capable of doing so much more, but is a workhorse that we have taken for on-the-fly two camera mixing too many events. Add a couple of cameras, an audio line from the sound board, and a 3 by 4-inch video monitor and you are up and running! You will double the price to buy ANYTHING else. This is an awesome, durable, entry-level (and then some) piece that I recommend all the time! Rated 5 out of 5 by Julie the VJ from I would buy this product again I'm a VJ (Video Jockey) and I use this when I mix live video to the music of DJs or musiciens. What's great about it is that it's affordable, compared to the Edirol and Vixid VJ mixers AND it has sound input/output which neither of the others have (I often record my live performances). Plus it has monitor outputs, which now the Edirol V8 has, but not the V4. And it's light weight. This is my 2nd one because the buttons (A/B) do start to go because it's not designed for VJing per say, but it did last longer than I anticipated (and now my older one can be modified and I'll have a backup). Rated 2 out of 5 by Dominic Mazzetti from Terrible Video and Sound Mixer This mixer is the worst piece of equipment that I've ever used in my life. In all of my 40 years of experience, I have to say color and the sliders on the mixer constantly fail. It always messes up on morning broadcasts and the quality of video is horrible. Color is never persistent, as everyday color is never on point. Do not buy this product as it is not worth $, your better off getting a video mixer and a sound mixer than this ugly hybrid. Rated 5 out of 5 by Tina, Video Artist from Great Product for the Money I use this product with video software which allows our church to place song lyrics over live video. This is a great product for the money. It's perfect for any group looking create dynamic graphics. It also gives the ability to copy live video and audio to any PC. Rated 4 out of 5 by Anonymous from Entry level Great If all you want is the ability to mix two video inputs for picture in picture or transitions or wipes, this is the unit for you. Just keep a few of things in mind: No digital capabilities. Only anolog input/outputs like composite and S-video. Cannot mix composite and S-video in the same input/output line. One way or no way. Have fun. Its a great starting point on a tight budget. Rated 4 out of 5 by Newsies from Looking forward to sharing this with my news team The video effects mixer is being used in our news studio. My 5th grade students are anchors, weather person and camera person. We are looking forward to enhancing our production and including PIP as the old newscasters did and the green screen as the weather people use today. Rated 5 out of 5 by Anonymous from Worked perfect out of the box This is a great portable video and audio mixer, perfect for live events. Took it new out of the box and was able to use it at a event the next day. Hooks up great with multiple laptops using the s-cables. Great quality for the price and portability. Rated 4 out of 5 by Anonymous from New Photo Gig I am so excited to have this new switcher. It has been a joy to use it. In the process it has taught me a couple of new things. At this point, I still have not found out all of the great things that it can do. how many cameras camcorder can i plug in ? You can connect a total of four cameras. Do note they must be SD or Standard Definition cameras and with these connections: 2 Composite &amp; 2 S-video Inputs. Description mentions 4 video outputs but does not say what kind. Composite? Component? HDMI? S-Video? Also lists only a single audio input. Is there no audio mix capability? No audio-follow-video? What are the audio input &amp; output levels? It has 2 composite and two s-video outputs. Each of the 4 composite video inputs have audio follow video. You can adjust the input and output levels. what is the difference between the Sima 9 and the Sima 11. Is the output any better?? I can only speak to the output of the Sima 11. We have been using it for about 6 months and have been very satisfied with the results. We are using it at a high school to film live sports and concerts, etc., using multiple cameras. Again the output has met our expectations very well.